The Garmin Edge 510 is the mid-range GPS cycling computer from Garmin. Featuring a 2.2-inch touchscreen and is waterproof, the Edge 510 measures distance, shows your speed, elevation and GPS position. By connecting the Garmin Edge to a Bluetooth enabled smartphone you can get weather forecasts and share your training and cycling activities with your friends and family. There are two different Edge 510 models available. Although the unit is identical, each bundle pack saves you money if you require further accessories. Extra accessories include Soft Strap Premium Heart Rate Monitor and Speed/Cadence. See below for more information. 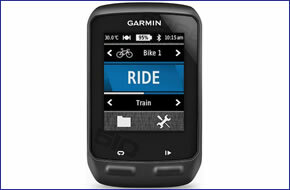 Garmin Edge 510 has been discontinued. Accessories, spares and parts are still available for your Edge 510. The replacement Garmin Edge model is the Garmin Edge 520. The Garmin Edge 510 is one of the latest cycling GPS navigation computer devices from Garmin. This Edge model has an easy to operate 2.2-inch touchscreen and is rugged and waterproof to IPX7 standards with a lithium-ion battery life of up to 20 hours. This system also uses both GPS and GLONASS to get a faster lock on satellites so this means it maintains GPS connection in built up areas and wooded areas, etc..
‣Edge 510 Performance Bundle - as above model, also includes premium heart rate monitor and speed/cadence sensor. All versions can be purchased by clicking the revelant 'add to basket' option above. The Edge 510 measures distance covered, displays speed and ascent/descent data and GPS location. Additionally if you buy either of the Edge 510 Performance Bundles they include a premium heart rate monitor and speed/cadence sensor. The Edge 510 features a barometric altimeter and temperature gauge which displays the temperature while you ride. Plus with its internal memory you can store up to 200 waypoints, routes, points and locations. You can connect the Garmin Edge 510 wirelessly to a smartphone (Apple or Android) via Bluetooth with the Garmin Connect Mobile app. You can get information such as weather forecasts direct to your Garmin device. With Garmin Connect you can manually or automatically enable friends and family to track you live on your journeys, training and races. In addition you can send and receive courses. If you intend to cycle on or off roads and want mapping for your Edge device we recommend buying the Garmin Edge 810 instead. This system comes preloaded with a basemap and unlike the Edge 510 has a SD Card slot so you can upgrade the maps. Furthermore the Garmin Edge 510 enables you to change the activity profile of the user with a single swipe of the touch screen. The user can choose between roads, mountain and touring settings which sets up your data preferences for each profile. You can also train and race against a virtual partner in real time when you are cycling along the same routes again. Looking for accessories and spares for the Garmin Edge 510? All parts are genuine Garmin product and specifically designed for use with the Garmin cycle GPS 510 device.